Jascha Heifetz, was born in Vilnius, Lithuania, which was then occupied by Russia, on February 2, 1901. He began playing the violin at the age of two, his first lessons from his father Ruvin, and entered the local music school in Vilna at the age of five. He made his first public appearance in a student recital there in December 1906, and made his formal public debut at the age of eight in the nearby city of Kaunas (then known as Kovno, Lithuania). With only brief sabbaticals, he performed in public for the next 65 years, establishing an unparalleled standard to which violinists around the world still aspire. Heifetz’s Berlin debut took place at a private press matinee on May 20, 1912, at the home of Arthur Abell, the Berlin critic for American magazine, Musical Courier. Heifetz’s public debut in Berlin took place four days later at the large hall of the Hochschule für Musik. A sold out audience packed the 1,600 seat hall. Fernow wrote to Auer that the recital was “a sensational success” and that “the public was wild with enthusiasm.” Heifetz also made debuts in Warsaw and Prague in 1912. He was to have made his American debut in 1914, but the outbreak of World War I precluded travel. His U.S. debut, finally took place at Carnegie Hall on October 27, 1917, with André Benoist at the piano. Two weeks after his Carnegie Hall debut, Heifetz travelled to Camden, New Jersey to make his first recordings for the Victor Talking Machine Company. Over the next 55 years, he made hundreds of recordings for RCA Victor and its English affiliate HMV. All of them remain in print, inspiring generations of new listeners. After extensive tours throughout the United States in 1918 and 1919, Heifetz—long before the ease of air travel—began a series of tours to the far reaches of the world. He became one of the first musicians to be well known through recordings before appearing in person. 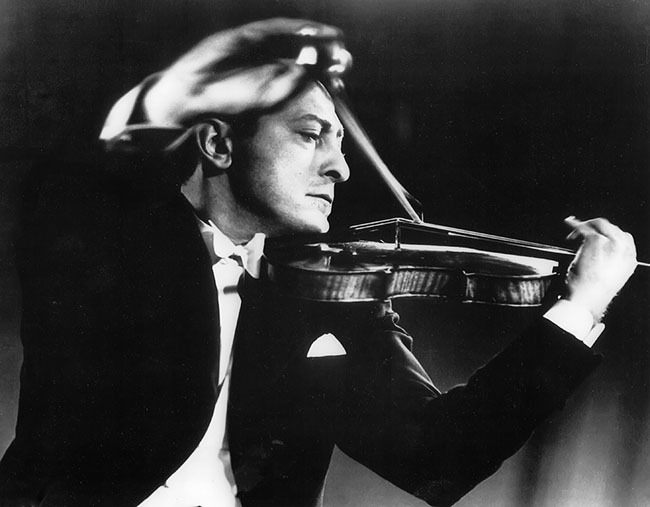 Heifetz performed in benefit concerts throughout his career. A “Victory Loan” concert that he gave at the Metropolitan Opera House in New York with pianist Sergei Rachmaninoff in April 1919 raised an incredible $7,816,000 to help pay for expenses incurred by the U.S. government during World War I. Heifetz donated his services to the USO during the Second World War, playing for thousands of service men and women around the world—often in dangerous situations. He gave concerts in and near war zones in hospital wards, sports arenas, and often from the back of a flatbed truck that carried around a camouflaged upright piano for his accompanist. One outdoor concert that he gave in Italy in 1944 was bombed, and he briefly found himself lost behind enemy lines in Germany in 1945. Heifetz contributed significantly to the violin repertoire by creating dozens of masterful transcriptions and arrangements of works by other composers. He published his first transcription, of Ponce’s Estrellita, in 1928. Two years later he created a sensation with his arrangement of Dinicu’s Hora Staccato. Heifetz was a close friend of George Gershwin, and he asked him to write something for the violin. Gershwin died before he could honor the request. Heifetz helped to make up for that loss by transcribing Gershwin’s three piano preludes in 1942 and songs from Porgy and Bess in 1944. They are now among the most beloved transcriptions in the violin repertoire. In the 1950s, Heifetz returned to Europe, Japan, and Israel where, in 1953, he was attacked by a man wielding a metal pipe for playing the violin sonata by the German composer Richard Strauss. He also continued to tour the United States and, in December 1959, he played at the United Nations in New York. Heifetz moved to the University of Southern California in 1962 where several of his masterclasses were filmed and broadcast on television. He continued to teach at USC until 1983. His last recital took place in Los Angeles in October 1972, 55 years after his U.S. debut. He continued to perform in concerts given by his students at the University of Southern California until 1974, when a shoulder injury put an end to his public career. Heifetz was married twice, to Florence Vidor from 1928 to 1946, and to Frances Spiegelberg from 1947 to 1963. Both marriages ended in divorce. He had two children, Josefa and Robert, with his first wife, and one, Joseph (“Jay”) with his second. Heifetz was an avid sailor, loved ping pong and tennis, and collected books and stamps. He died on December 10, 1987 at Cedars-Sinai Medical Center in Los Angeles.